My hubby called this morning and said that he would make the drive home today for a visit and to cut the boys hair in time for Mass tomorrow!!! Yeah!! Well, he arrived with roses for the girls and I. Wasn't that sweet?!?! I just love roses! (During his last visit he gave the boys fire tee-shirts, and told the girls he would have a surprise for them next time...) Chiquita has been talking about it all day, and has been telling everyone, "Daddy gave me pink roses!!!" 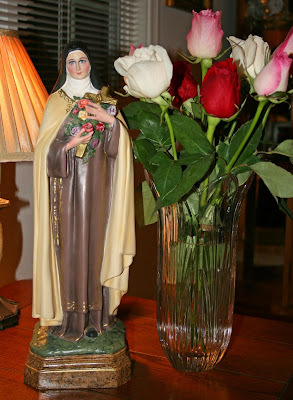 We placed all our roses in a vase and set them near our favorite statue of St. Therese. After hubby left to head back to the fire, a brave sweet friend of mine called to say she was on her way to pick up my children (the oldest four) so I could work on cleaning the house and try to finish sorting though all that clothing... So, all evening, it was just Snuggles and I, and I am amazed at how much I was able to accomplish!! Thank you Marci... It was just what I was needing, and even though I still have quite a bit to do, I am not nearly so overwhelmed. how awesome that your anniversary is the day after St. Therese's feast day! Happy anniversary on thurs. you are truly blessed, jessica! Glad your day was so productive and especially glad to hear the end is in sight for fire duty. Love the roses - very fitting for your home. Have a great week with all the wonderful reasons to celebrate. Glad you had a good weekend! Hope your anniversary is special!